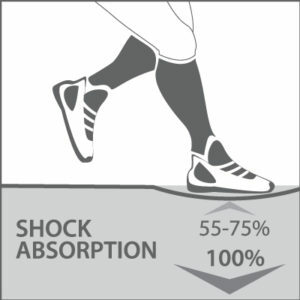 Shown as a percentage, shock absorption represents the extent, to which a sports floor covering is able to soften an athlete’s landing, as compared to an inflexible concrete slab surface. The best types of sports floors are required reduce the impact by 55 to 75%. This is the optimal range that ensures athletes’ comfort without compromising speed or performance. This index is used for games and activities that involve a bouncing ball. It shows difference rate of basket ball bounce from tested surface to bounce from concrete slab surface. The resulting index must be at least 90% of the bounce from concrete. Deformation of a flooring surface following dynamic impact of 1500 N. This index is measured in conjunction with shock absorption, and its optimal range is 2.3mm to 5 mm. Operational factor that indicates the ability of the flooring surface to withstand to heavy carts with rubber wheels that are frequently used to move various sports equipment. 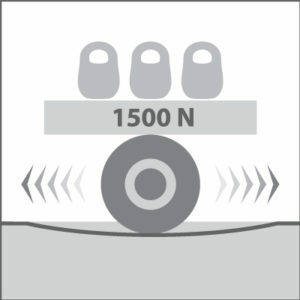 The tests are carried out with a load of 1500 N (153 kg). This factor measures resistance to sliding upon impact of clean athletic shoes on a dry flooring surface. The test uses a special pendulum device, and requirement measurement needs to fall within 80 and 110 range. 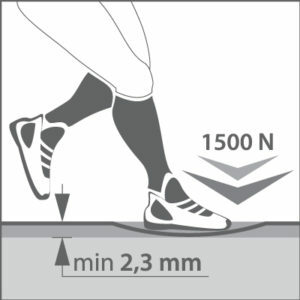 A lower result indicates that the floor it too slippery, while a higher suggests that athletes’ will “stick” to the floor, limiting their range of movement. Surface friction impacts athlete’s ability to move along a complex trajectory. This factor measures the spread of deformation of the surface finish that might occur as a result of dynamic impact. 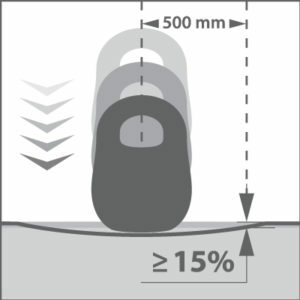 Acceptable deformation is within 500mm from point of impact, 15% of total deformation at the point of impact. This factor shows that any impact that an athlete apply on the flooring surface will not effect on ball bounce or trajectory. General Information. In-depth research of floor coverings for sports, started in the middle of the twentieth century, helped to understand the optimal parameters of interaction between athletes and flooring platforms, on which they perform. Bio-mechanical studies formed the basis of modern regional and international standards for regulating properties of sports floors, and led to creation of specialized testing equipment, such as the Artificial Athlete (Berlin-Stuttgart). The most authoritative and comprehensive regulations include European standard EN 14904 , German DIN 18032-2, American ASTM F2772. 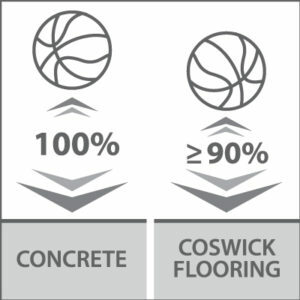 Despite minor differences, the main parameters of the three are standardized, which is excellent for both producers and consumers of sports floors. These standards set functional characteristics, such as shock absorption, vertical deformation (dynamic load of 1,500 N), coefficient of friction, gloss level, ball bounce, as well as performance characteristics – rolling load, durability, wear resistance and safety features.